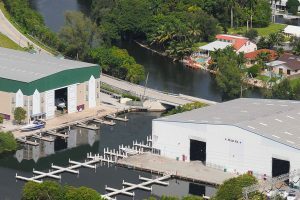 Thunderboat Marine features two secure indoor boat storage facilities in Dania Beach with convenient access to the Intracoastal Waterway and Atlantic Ocean. Our state-of-the-art dry rack storage facilities will keep your boat safe and secure while offering a wide range of amenities and services to maximize your boating pleasure. On-trailer storage is also available. *Size & height restrictions apply – subject to availability (rates are subject to change without notice). Please call for fixed bridge restrictions. Offering the best rates in Ft. Lauderdale and Miami for dry boat storage.